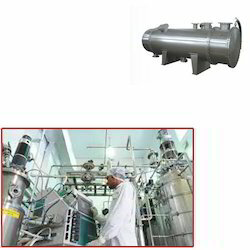 We are an eminent orgainsation engaged in offering an extensive range of Heat Exchanger for Pharmaceutical Industries. The offered exchanger is precisely manufactured by our skilled professionals following high definition engineering principles and utilizing premium quality components. This exchanger is tested properly against numerous parameters in order to deliver defect free range. Customers can purchase the offered exchanger from us at economical rate. Looking for Heat Exchangers for Pharmaceutical Industries ?